As many of you remember, we lost our beloved Jersey Polly on April 22. She left behind her then-seven-week-old calf Anna (whom we have taken to referring to as Little Orphaned Anna). Anna refused to take a bottle, so in desperation we pressed Amy into nurse duty. Well let me tell you, Amy hates acting as a nurse cow. 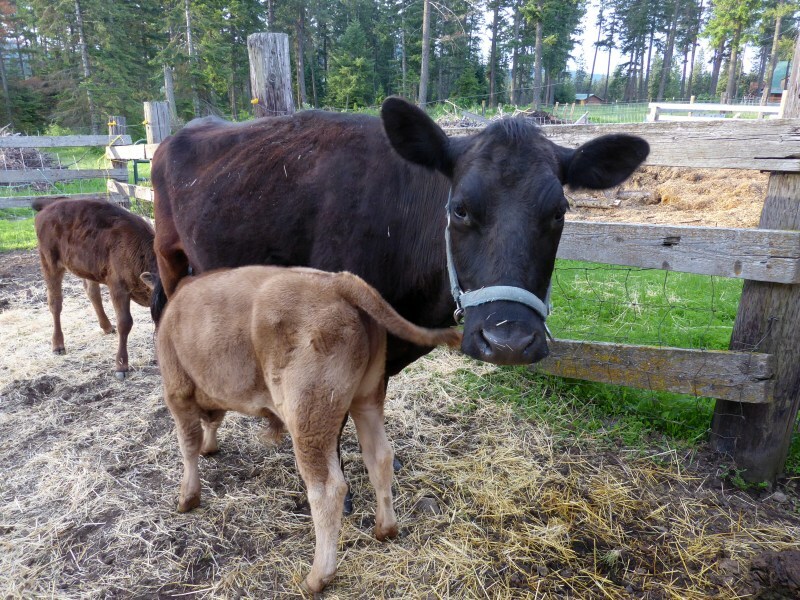 She will grudgingly let Anna nurse, but only when her own calf Trooper is nursing. No Trooper, no Anna. This is a photo of a cow who hates her job. She is literally glaring at me because I have her lead rope looped around a post to make her stand still long enough for Anna to fill her belly. Over the past few weeks, we've developed a routine. We keep Amy's calf Trooper in the corral with Anna. We put Amy into the corral in the evening, let her nurse the calves, then at dark we put the calves in a pen for the night. Around 6 am in the morning I release the calves, let Amy nurse them, then lead Amy out of the corral and release her into the pasture with the rest of herd to graze. 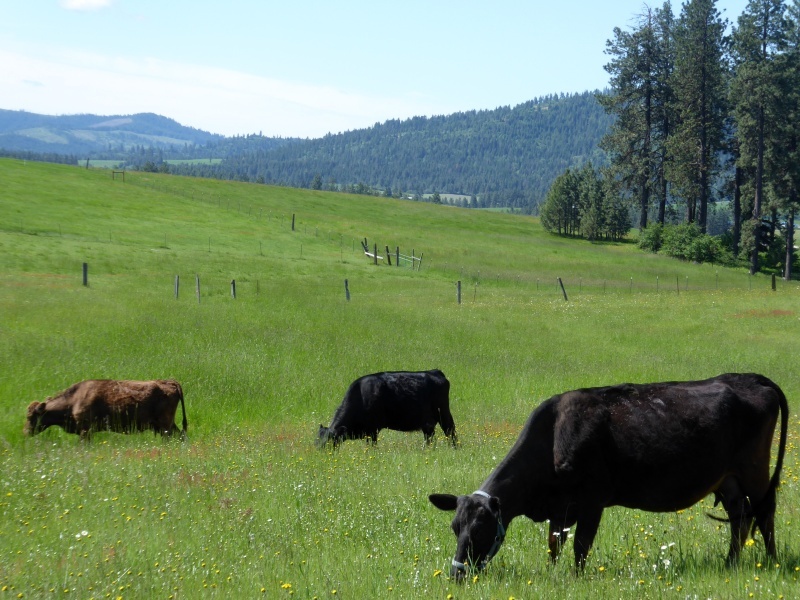 At noon I bring Amy up, have her nurse the calves, and turn return her to the pasture. Around 6 pm, I bring Amy up for the night, have her nurse the calves, and leave her in the corral over night. Rinse and repeat, day after day. As I said, Amy hates it. She hates being brought into the corral when she's enjoying the fresh grass and the company of the other cows. She hates being forced to nurse a calf which isn't hers. We've learned to stand with her holding the lead rope while she's nursing the calves lest she chase Anna off prematurely. Over the last week or two, Amy has developed a nasty attitude when it comes time to bring her up from the pasture. She'll pull little tricks like just flat-out lying down and not getting up, no matter how much I tug on the lead rope or shout at her. In fact, escorting her up from the pasture has become a two-person job: I do the leading, and Don follows with a stick to whack her rump if she balks. She knows Don won't brook any temper tantrums, so she usually follows docilely enough when he's there. But if I'm solo, forget it. Last night I tried to bring Amy up solo. No such luck. She balked, she laid down, she dragged her feet, she twisted and writhed on the lead rope. I was getting more and more frustrated and wished I could beat her to a pulp -- believe me, not something you want to do with a milk cow (or any cow). When I go out solo I bring the cell phone with me in case I need to call Don, who comes along armed with a stick. As soon as he gets close enough, Amy starts moving and gives no further trouble as I march her up to the corral. Two days ago I was busy in the evening, so we fetched Amy up from the pasture, but this time Don stood with her on the lead rope while the calves nursed. And -- he sang to her. "She had her eyes half-closed," he commented as he told me about it. So yesterday evening, when I was ready to murder a cow, I did the same thing while I was holding her lead rope while she nursed the calves. I sang Amy a lullaby over and over. And it worked! She started chewing her cud, she didn't fight off Anna, and she generally calmed down. And so did I. I no longer felt ready to murder Amy and I emerged from the corral feeling better. Music does indeed sooth savage beasts. Both of us. We'll keep up this routine for another month at least. At that point Anna will be four months old, the youngest recommended age for weaning a calf, and we can release her to the rest of the herd. She'll doubtless be able to sneak milk from the other cows, who are usually pretty good-natured about double-dipping. And in the meantime ... we'll sing. I'm taking notes for my own use! The jersey we got a few months ago just freshened (her fourth calf, we're told), and we've been learning how to teach her a routine. 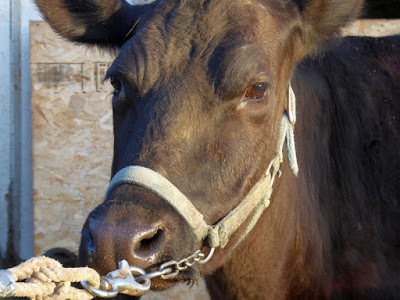 She's not halter trained (we're working on that), and the first time we tried milking, we lured her in with alfalfa cubes, but the next day she wouldn't come for anything, and we had to give up. The third day, we caught the calf and lugged him to the barn, knowing mommy would follow (picture two forty-ish guys lugging a 100 lb. calf from the farthest corner of the water, ankle deep in mud in most spots because of irrigation difficulties, and a half-ton mother suspiciously snapping at their heels...). 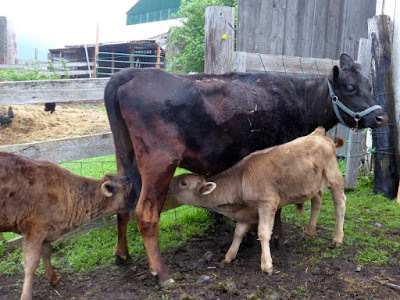 We left her and junior in the barn for a week or so, to get them used to the place, and now, a few days after their release, momma cow generally comes reluctantly when we show up, and stands mostly still for a milking so long as we keep the trough in her stanchion well stocked. Anyway, I welcome other ideas to help keep us all calm. Thanks! Dearest Patrice, I love Rural Revolution! Been reading it almost every day for years! Only commented once, I believe, but could do so on just about every post! This post was hilarious! Will recommend it to my Facebook friends. ever heard of tail twisting--way to make a cow move. also watch the movie 'the tears of the camel'. yep tail twisting works, however watch out for flying hooves if she get's a little grumpy about having a tail twisted! I've read that they give more milk when music is playing, too. Gramma said she always sang while she milked. The cows would shuffle and complain if she didnt. Didn't you sing to your own babies while they drank a bottle and got all drowsy for sleep? One of my favorite memories with my little toddlers was singing silly songs with them and doing silly dancing. They're all over 6 ft tall with deep voices and beards now, and I miss the singing and dancing with babies. You named Amy's bull calf "Trooper" after my suggestion on April 25th post on "Update on Little Orphaned Anna." At least I hope you did, I feel proud you named him that! reminds me I used to "sing" to my chickens when they were on their roost at night and I would go to shut the door, and sing the scales La, La , La ,etc ...and they would murmer along with me and seemed to settle down ...like singing taps to the troops i guess. I bet you can train her to the song eventually she may just come along as you start to sing.! Animals are so interesting ! Would love to be standing around the corner listing to the singing. Always had a radio in the barn, when milking. Did not have to be music. Radio was tuned to KHQ, those days every morning was all farm news. Have a radio out in my garden area, plays 24/7, no more "old country music" on the radio in our area so have to settle for NPR. I found this out recently. I had to go into the chicken coop with a really aggressive rooster to make repairs. I sang old hymns the whole time. He left me alone. May be anecdotal, but I left unscathed. This is so cool! I have realized lately how often we only use the one option that's routine to us. We enjoy the pretty sight of nature but forget to smell it. We hear the lovely music but forget we can feel the vibrations. We taste the coffee but forget to notice the smooth texture. This post has reminded me anew. When we're feeling frustrated with how things are going, look for a different tool/option/way/perspective. Excellent and interesting. Grandma was right, 'Necessity is the mother of invention'! I assume you know the correct quotation reference is actually music soothes the savage breast ? Of course. And as pertains to nursing calves and referencing a milk source, the original would certainly fit. But since we have "beasties" and not "breasties," I thought the deliberate misquote was apropos, LOL. Soothe the savage beast indeed! I sing to my cats when I have to give them a bath. It does indeed help.